Torchlight 2 – another gift from my friends (I have very generous friends)! I've heard a lot about the original Torchlight in how it was a breath of fresh air in the hack 'n' slash RPG genre – a truly worthy Diablo-clone. I also read that the original was developed in a jaw-dropping 11 months, which is a very impressive feat! Unlike Diablo though, Torchlight lacked any multiplayer and was a single-player only affair. 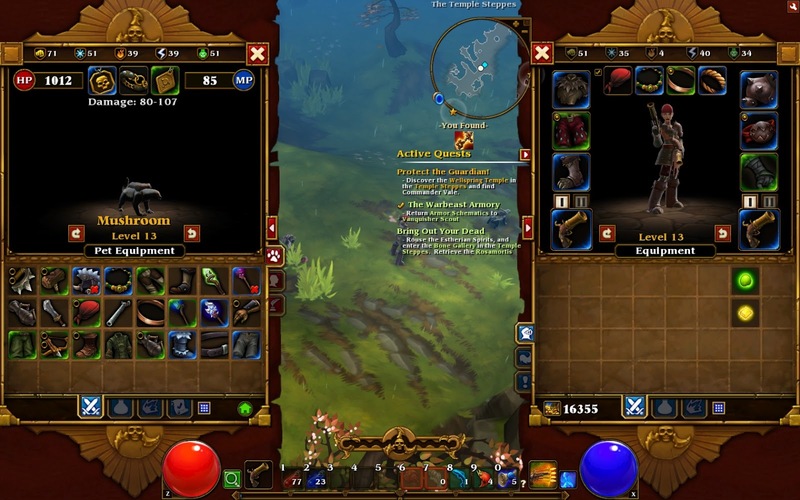 Its sequel Torchlight 2 rectified that, giving you the ability to play co-op with your friends. So instead of playing Torchlight 1 first, I jumped straight into Torchlight 2 to see if it was any good! As an exercise, let us compare the plots of Diablo II with Torchlight 2! A player character from the original game tried to contain the essence of Diablo within him. The character is known as the Wanderer and he ends up going on a long journey to the east, wreaking havoc in his wake, thanks to Diablo's corruption and his inability to contain the evil. Along the way he travels through a temperate zone, a desert zone and then a jungle/swamp zone before reaching the end where you finally fight him. The game is broken up into three acts and an epilogue. A player character from the original game is corrupted by the Ember Blight. The character is known as the Alchemist and he ends up going on a long journey wreaking havoc in his wake, thanks to being corrupted by the Heart of Ordrak. Along the way he travels through a temperate zone, a desert zone and then a jungle/swamp zone before reaching the end where you finally fight him. The game is broken up into three acts and an epilogue. Very similar plots right? It's pretty much a direct copy of Diablo II if you ask me. Consequently, I don't think much of Torchlight 2's plot as I've largely forgotten most of the details, characters and locations. While Diablo 3's plot wasn't fantastic at least they tried to make it a bit different to its predecessor! "Consequently, I don't think much of Torchlight 2's plot as I've largely forgotten most of the details, characters and locations. While Diablo 3's plot wasn't fantastic at least they tried to make it a bit different to its predecessor! " Gameplay is similar to any hack 'n' slash RPG – i.e. it's relatively easy and just relies on reflexes more than anything else. Just hover over your target, left click to do a standard attack and right click for a special one. The number keys correspond to a belt which you can place inventory items like potions or spells in. Simple. Thankfully, this means the gameplay is better than Diablo 3 in some regards, because it's more similar to Diablo 2 than Diablo 3. You can quaff potions like there's no tomorrow in Torchlight 2 (well at least the cooldown is very quick) and there are alternative ways to heal, instead of the health glob system that is used in Diablo 3. This means you don't need to waste skill points on healing skills and just focus on offensive/defensive abilities. Another nice feature is the ability to send your pet to town to sell and buy items. This means you don't need to waste time travelling back and forth to town and can just continue with your quest (your pet will automatically find you once he/she is done). However (like a lot of hack 'n' slash RPGs) the game can often become a mindless click-fest – which is fine if you don't want to think but for those wanting more mental simulation, it's sadly lacking. Audio is generally well done in this game although sometimes your minion/pet sounds are quite annoying – especially when they make the same growling noises every 5 seconds! Sorry, I mean, Matt Uelman! Thanks to Matt Uelman, who was responsible for the excellent Diablo and Diablo II soundtracks, Torchlight 2 retains the same dark and eerie ambience. 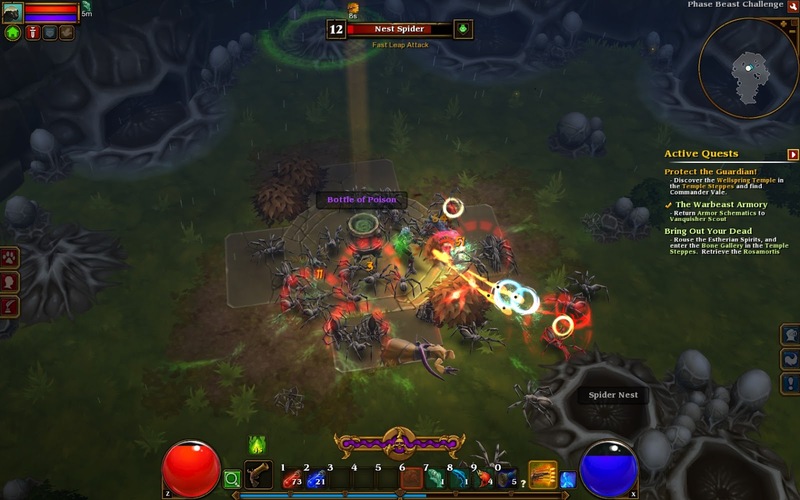 Torchlight 2 adopts a bright, colourful almost cartoony approach to its graphics. While it might not be as fancy as Diablo 3, the game runs a whole lot smoother on a modest system. Replay value for Torchlight 2 is slightly better than Diablo 3 since loot drops are more frequent. However, similar to all Diablo games, replay involves playing a linear story all over again and do you really want to do that? Worse, unlike Diablo, your Player Character doesn't really talk and there are no different conversations with NPCs depending on your character class. Didn't notice any bugs and the UI is quite easy to use. For the Diablo fans disappointed by the changes made to the most recent game in the series, Torchlight 2 will make them feel right at home. Runic Games has basically taken the gameplay and story from Diablo II and set it in the world of Torchlight. However, this is also the game's Achilles Heel as it might feel a bit too similar to some. The reason Torchlight II is similar to Diablo II in a lot of ways is because it's largely the same team that made it. After Blizzard dispanded Blizzard North (who made DI&II) and let go most of those employees and handed Diablo III over to their own studio, a lot of those employees from Blizzard North went on to create Runic Studios. For me, this makes Torchlight II a more attractive purchase for me, and it's awfully depressing when you think how good Diablo III would have been if it were made by Runic - which originally, it would have been.